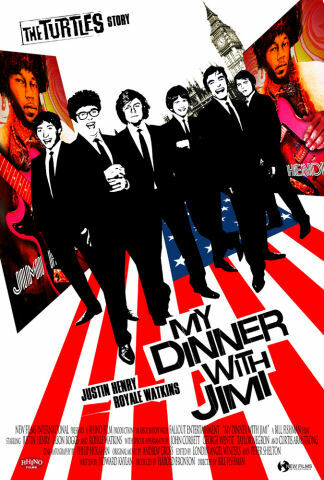 I just wanted to say that Royale Watkins does a dead on perfect Jimi Hendrix in Howard Kaylen’s My Dinner With Jimi. A great flick, a Turtles biopic, a true story, with the most eerily perfect Jimi Hendrix I ever saw. On top of all that the movie is really funny. Great screenplay, tightly written I believe by the Turtles lead vocalist Howard Kaylen himself who appears to remember so much from the sixties you’d doubt he was there, except, of course, that he was. Great casting too. All around a terrific film. How it never became a sensation I don’t know. Almost nobody I know has ever seen it. I’d show you a clip but it’s better to watch the entire movie for the full impact of Royale Watkins’ performance. The story builds up to it. It’s a funnier rock’nroll flick than Almost Famous, which I thought was really good too, except this story really happened. It’s also set a couple years before Almost Famous, long before rock’n’roll had become jaded, so there’s all that innocence to mine for material, something not possible in any film set even a few years later, or in any music film since. A generation’s innocence is a rare and fleeting thing, scarcely believable to later audiences. Yet it works here. It works in the great Canter’s scene (dig Jim Morrison, nothing like the Gothic myth). It works in the great draft board scene. And in London where that innocence is shattered by the very purveyors of all that innocence, the Fab Four, after which Howard Kaylen’s dinner with Jimi provides the story’s denouement in that it all comes up again. The film came out it 2003, I think, and I have no idea why it never caught on big. Weird how that works. Some hit, some don’t, ya never know. How is the weather. This entry was posted in Movies, Psychedelic. Bookmark the permalink.